GE’s ZeeLung cassette provides low-energy nutrient removal in municipal wastewater. According to GE, the energy used by water and wastewater treatment plants in the United States accounts for 35% of a typical local government’s energy budget. Aeration for biological treatment is the largest energy consumer in a wastewater treatment plant, typically representing 60% of a facility’s power usage. In conventional biological treatment, fine bubble aeration is used to deliver oxygen to the microorganisms that metabolise the nutrients and organic pollutants in the wastewater. However, this approach is not efficient since most of the oxygen is wasted. ZeeLung technology transfers oxygen by diffusion to a biofilm that grows on the outside surface of the membrane. The microorganisms in the biofilm remove nutrients and organics in the wastewater by metabolising them in the presence of oxygen. The result is a four times reduction in energy compared to conventional fine bubble aeration systems in use today. ZeeLung MABR technology allows municipalities to achieve nutrient removal and/or capacity expansion in existing tank volumes while significantly reducing energy consumption. 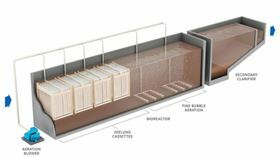 ZeeLung cassettes are immersed in existing bioreactors to improve treatment performance and/or increase treatment capacity without the need to expand the footprint of the facilities. GE developed the ZeeLung technology to enable wastewater treatment plants to achieve energy neutrality by significantly reducing the energy demand of the largest consumer in a treatment plant – biological process aeration. Coupling this energy reduction with enhanced on-site energy production from advanced anaerobic digestion can achieve energy neutral wastewater facilities – where the energy produced equals or exceeds the energy consumed. “By inventing ZeeLung, GE is creating an opportunity to transform wastewater treatment plants from disposal facilities to resource recovery centres that yield clean water, nutrients and renewable energy from wastewater,” says Heiner Markhoff, president and CEO – water and process technologies for GE Power & Water. ZeeLung will be commercially available in 2016.